The Social Democrats retained their lead at the top of the polls in Yle's monthly tracking poll, and the Finns Party gained some support. Yle's monthly tracking poll suggests that the Social Democrats are the most popular political party in Finland, favoured by some 20.3 percent of respondents, followed by the National Coalition on 19.7 percent. Both showed a slight increase on their figures from the same poll last month. The Centre Party, which took the Prime Minister post by getting 21.1 percent of the vote in the 2015 election, languishes on 16.6 percent. 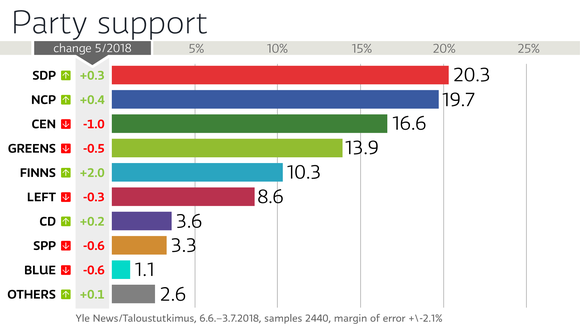 In fourth spot is the Green Party, on 13.9 percent, while the poll suggests the Finns Party's support is around 10.3 percent—an increase of some 2 percentage points on June. Even that figure, however, is within the poll's 2.1 percentage point margin of error. The poll was conducted by Taloustutkimus between 6 June and 3 July, interviewing some 2,440 Finnish citizens aged between 18 and 79. Of those, 63.1 percent gave their party allegiance. More on the data is here (in Finnish).